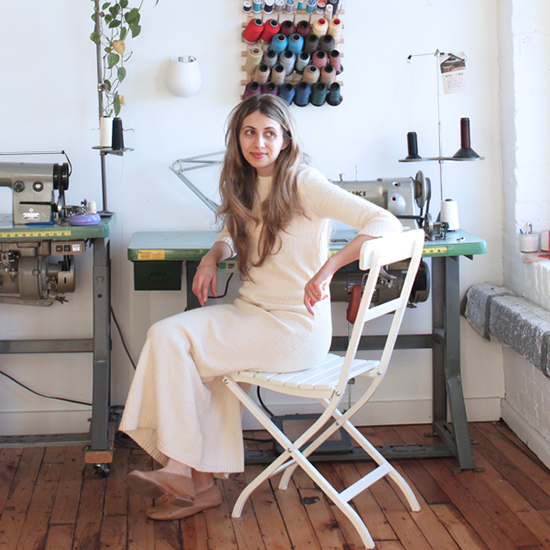 Before launching Rennes—her line of minimalist bags, pouches, clothing and ceramics—in 2008, Julia Okun held down two jobs. Both “pretty boring,” she says with a laugh. She’d been a sewer from way back, so she started tinkering with items, built a website and hopped onto then-bourgeoning Etsy. Her sweet and simple designs—inspired by travel, archeology and history (“Rennes” refers both to a French city and a legend about the holy grail)—took off from there. We talked to this stylish entrepreneur and Boston native about juicers, shoes and all things Japanese. I went to Japan in college, and I really fell in love with their aesthetic and attention to details—even how they’d wrap or present things, that’s really inspiring to me. If I’m making a piece of clothing, I try to keep it pretty simple, but I like having small accent details and things like that. I love Kyoto. There’s a cool shrine there, (1) Fushimi Inari; it’s all these red wooden torii gates. It’s really beautiful. Japanese shopping malls and department stores, like (2) Takashimaya are really interesting, too. They have a lot of vendors, and there’s usually a supermarket, and everything is immaculately wrapped and presented. What designers do you like right now? I really like (3) Maison Martin Margiela. It’s this deconstructionist, minimalist stuff. They make (4) leather Tabi ballet flats that are split-toe, Japanese-style, and I have a pair of those. I had to save up because they’re pretty expensive, but it was worth it. My husband and I both have a ton of tea—we’re always having to go buy more—so I have different green teas at work. Because I started doing ceramics, I have so many mugs! It’s a lot more fun to eat off your own ceramics. I’m pretty into Korean food, because the neighborhood my studio is in, for some reason, has a lot of Korean restaurants. I should be packing lunch from home, but I find myself ordering Korean takeout more often. (5) Bon Chon has this thing called tteokbokki, which is this dish of Korean rice cakes and veggies and fried noodles; it has tomato sauce on it, and you can get it with cheese and different toppings. It’s one of my favorites. My husband got me a juicer, so I’ve been trying to stop buying the fresh juice that costs like $10 and trying to make my own! Once a week, I fill some plastic containers with juice for the week. I’ve tried doing green ones, but I can’t get the proportions. I like (6) carrot-orange-apple, and I do beet with apple and mint a lot. Mint makes everything taste great. What kind of look do you like for a night out? I’ve been wearing a lot of black lately. I like wearing just a linen dress and leggings, and if it’s not too cold out, I’ll wear these (7) Martiniano shoes that I sell or (8) Repettos. For the winter, I’ll also wear a lot of big sweaters that I’ve knit. A lot of times I end up wearing things that I’ve made. In the winter, I don’t really carry a bag a lot, which is funny, because I make bags. I just put things in my smallest pouches and coat pockets, because I feel so heavy with all the coats and boots and things. But otherwise I’ll carry one of my own bags or a backpack. Where might you go for dinner? (9) Oleana in Cambridge is good Middle Eastern-style food. They have delicious muhammara, a dip with red pepper and pomegranate molasses. We also really like (10) Dorado, a taco place ideally situated between where we live and where we both work. We’ll stop there on the way home. There aren’t a ton of taco places here in Boston, and the ones we do have are really snooty and expensive, but these are perfectly priced and really good. I get the shrimp tacos, with chipotle shrimp and jicama, which are delicious. What would be your favorite food to eat while wearing stretchy pants? Oh: (11) Indian food. Now that I think about it, a lot of Indian food.